The 311DS is a high performance incubator with a built-in orbitalshaker. 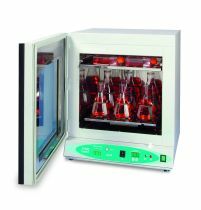 A broad temperature range expands the use of this incubator to liquid cultures, washing blots and other shaking applications requiring strict temperature control. Temperature within the 311DS is precisely regulated by theSmartChek temperature control system. All electronics are located away from the chamber to protect them from heat related stress. The sturdy, integral shaker has a 19 mm orbit. A flat platform with non-slip rubber mat, as well as a variety of flask platforms are available separately, Platforms can hold as many as four 2L and six 1L flasks. The gasketed door has a large, integral viewing area for checking samples without disturbing the chamber contents. Opening the door stops operation of the shaker. The incubator is supplied with one shelf. Additional shelves and shaker platforms are sold separately. Ideal for: bacteria cultures, yeast cultures, entomology studies, egg hatching, hybridization washes, mixing and resuspensions.